Together with Sixbid, Ex-Numis, the expert in finding lost provenances of ancient coins, has developed a new feature that gives the bidder absolute security about where his coin stems from. Every provenance from the catalog that pre-dates the year 2000 can be linked directly with the relevant Ex-Numis database entry. 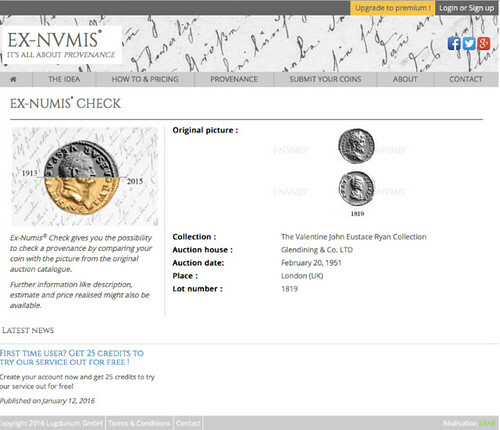 Since 2016, Ex-Numis has offered private collectors, museums, and coin dealers a professional research into provenances. A sophisticated program uses leading-edge digital image recognition technology to search the Ex-Numis archive that currently contains more than a million illustrations of ancient coins. This gigantic archive stores the material from auction catalogs dating from the late 19th century up until the year 2000. Künker in Osnabrück is the very first auction house to provide his customers with the opportunity to access the Ex-Numis archive in order to check for themselves the provenance of the coins offered in Auction 295. Every provenance from the Künker catalog that is registered in the Ex-Numis archive will be linked directly with the relevant archive picture so that the customer can see for himself that the information is in fact correct. This feature is currently expanded. Descriptions, estimates, and results are added one by one. As a special service, Ex-Numis plans to not only record the result but also to compare this with the inflation-adjusted hammer price. This particular feature will exclusively be available to Sixbid users. 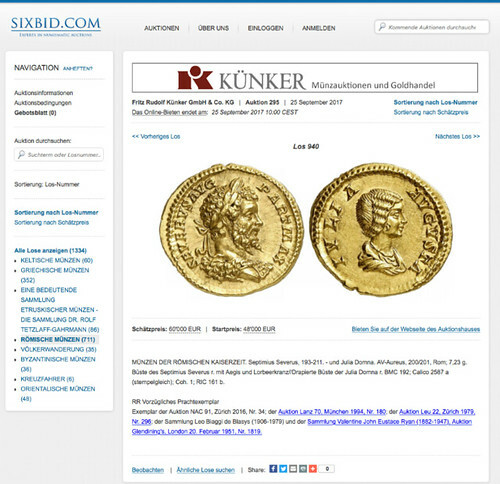 To check out the new feature, visit the current Künker Auction 295 offering coins from the ancient world at https://www.sixbid.com/browse.html?auction=3994&category=104034 Further information on the services of Ex-Numis can be obtained from the website https://www.ex-numis.com. If you want to research into the provenances of your own collection, just go to the site https://www.ex-numis.com/page/how-to-and-pricing.html to learn more about how to and pricing. 1. Lot 940 from auction catalogue Künker 295 stems from the following auctions: Lanz, Munich 70 (1994), no 180, Bank Leu, Zurich 22 (1979), no 296 and the John Eustace Ryan collection, Glendining, London (1951), no 1819. 2. Links direct each user immediately from the provenances to the Ex-Numis archive. Additional details like description, estimate, price realized and inflation-adjusted hammer price will be available soon.